So far I've only tried it out for a day but it seems to breathe a lot better. Thanks for posting, looks nice! Which color option is this? I'm debating between the black/gray vs all black. The blue and red options seem a little too bright on their website. hishnika wrote: Thanks for posting, looks nice! Which color option is this? I'm debating between the black/gray vs all black. The blue and red options seem a little too bright on their website. This is the black/gray option. You can get them to mail free samples of up to 5 materials, so you could see them in person if you wanted. The black and gray option would be great. How did you order what you received? I would like to duplicate your order. I actually ordered through Costco since they seemed to have the best price. The Veloci-Vent is the same thing as Spacer Mesh from the Coverking site, so wherever you order from then just make sure you pick one of those two. Costco basically redirects you to a storefront that Coverking hosts, so Coverking still manufactures and ships it. 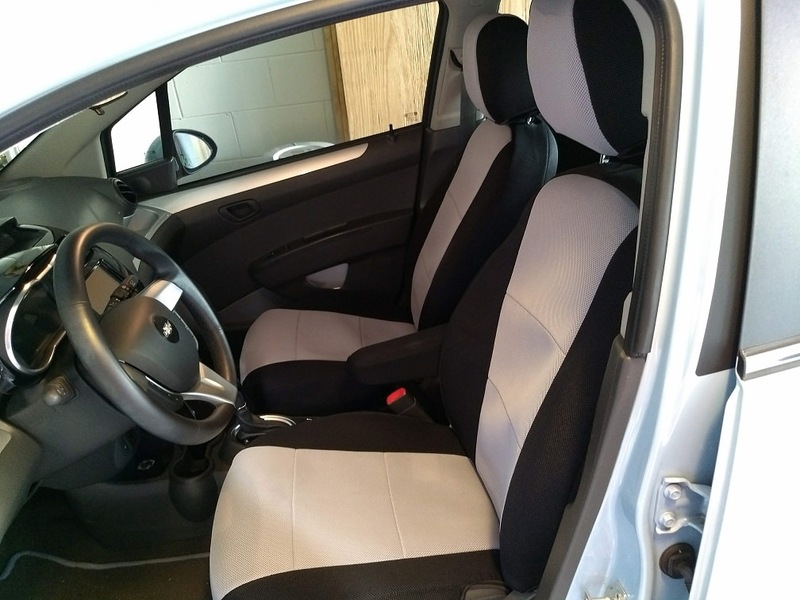 Then I just selected 2015 Spark as the vehicle (they don't have the EV but the seats are the same), one row (my back seats are still leatherette), and then selected the black/gray option. It took about 3 weeks to come then if I remember correctly. Thanks very much for posting the information about how to purchase the CoverKing seat covers. I have a Costco membership and I plan to purchase a set of covers for just the front seats in my 2014 and 2016 Spark EVs. Added note: How difficult is it to install the front seat covers - especially the seat? I installed mine last week (all black), took about an hour, taking my time. Definitely liked having the kevlar glove to dig under the seat. At first I didn't understand that the thin flappy material of the back cover that you push through the seat is supposed to wrap up the back of the seat so you can put the velcro on top of it to hold things nice and tight. Other than that everything was pretty self-explanatory. Some of the little side hooks for the seat cover can be pushed through the side of the seat cushion and attached to the larger straps under the seat. Overall not hard if you can stay on your knees for a few minutes. hishnika wrote: I installed mine last week (all black), took about an hour, taking my time. Definitely liked having the kevlar glove to dig under the seat. At first I didn't understand that the thin flappy material of the back cover that you push through the seat is supposed to wrap up the back of the seat so you can put the velcro on top of it to hold things nice and tight. Other than that everything was pretty self-explanatory. Some of the little side hooks for the seat cover can be pushed through the side of the seat cushion and attached to the larger straps under the seat. Overall not hard if you can stay on your knees for a few minutes. Are you happy with the results? Do you have any pictures? I tried taking pics but they all came out poor due to my tint and black seats. But I like them a lot. The spacer mesh material looks very nice to me, not at all cheap. For some reason the all-black seems like the closest to "factory" look to me, maybe because I also got black floor mats from costco. The main wins are that I no longer have a sweaty back after a drive, and I can swivel and get out easily since the material doesn't grab you like the vinyl does. I actually liked them so much that I ordered some for my wife's (different) car with ailing leather seats. hishnika wrote: I tried taking pics but they all came out poor due to my tint and black seats. But I like them a lot. The spacer mesh material looks very nice to me, not at all cheap. For some reason the all-black seems like the closest to "factory" look to me, maybe because I also got black floor mats from costco. The main wins are that I no longer have a sweaty back after a drive, and I can swivel and get out easily since the material doesn't grab you like the vinyl does. That's great. Thanks for the reply.